Here is some stuff from Keeping Dry, Staying Warm, our training program and book coming out later this year. 3 key reasons why multiple layers are better than fewer thicker ones. Each layer has a distinct function designed into it by the garment maker, moving water out or stopping it getting in or insulating or blocking wind ( to improve insulation). Each layer traps air between the next so you get something for nothing, for no weight. Trapped air is the best insulator, not ‘xyz super stuff’. More layers means simpler layers and the simpler and less complex each layer is, the easier it is to understand its real function. Can all layers be worn all at the same time? In my case 6 layers. Can almost any be worn next to skin when in tent in case of a serious soaking? When it gets warmer during the day or the trip ( hopefully!) and have stripped to the minimum, have we checked pack capacity is enough to carry all these and can we cope with the weight? Our book comes to the conclusion that the ‘3 layer system’ is ‘past its sell by date’ and needs revision. There is complete consensus within our collaborative team which includes Chris Townsend, Tom Richardson and Chuck Kukla in USA that the 4 layer system is now the basic layering system. The ‘new’ garment, the windshell, didn’t exist when the 3 layer system was created in early 80’s. This was essentially to help people understand how they should dress for the outdoors. Base layers were relatively new, fleece was totally new and rain shells (aka hardshells) were heavy and in their infancy. Personally I use a windshell for rock climbing, alpine, ski touring and Nordic backpacking, cycling and running. Everything indeed except lift assisted skiing. 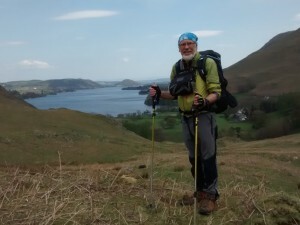 But my rainshell is always ready in my pack, after all I do live in the Lake District! 2.Bad weather – l/s wool base with collar,long neck zip and thumb loops. 4. Windshell Pertex Quantum, I wear this almost all the time unless it gets very warm. It’s highly windproof @ 0.5 cfm and water repellant so my expensive and relatively easily damaged rain shell, stays in my pack. 6. Rain shell, keep in pack, use only when its raining. 1. 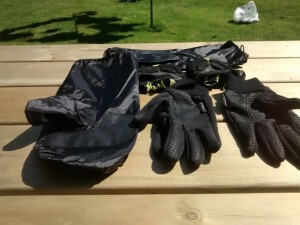 Fingerless cycle glove, used with poles all the time. 2. Powerstretch glove. Just about enough to keep hands warm but still thin enough to handle stuff. 3. Waterproof overmitts. These strange looking beasts are hard to find and came from a motor cycle company, and they are less than 100g. Keeping hands warm is often a case of keeping them dry. The outdoor industry thinks we always need insulated waterproof gloves. NB protection from water, dirt and ticks which cause Lymes disease.